This GRI certified training is tailored to impart the know-how required for preparation of a sustainability report based on the GRI Standards. This training, with reasonable effort, will enable you to prepare a top-quality sustainability report focused on key topics relevant to your business and stakeholders. 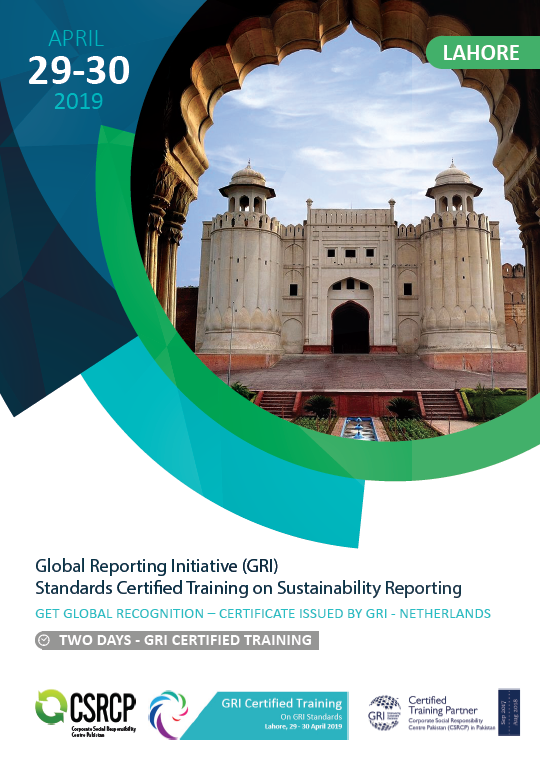 Training is based on the GRI Standards for sustainability reporting. Local cases and best available global practices will be used for the purpose of clarification. The discussion about trends in sustainability reporting will ensure that participants are updated on current developments. The training methodology includes presentation, case studies, group activities, quizzes, opinion poll and discussion on best practices examples. CSRCP is the first and only GRI Certified Training Partner in Pakistan. Training participants will receive an official certificate issued by GRI. More information and registration for the training can be found if you click on the link below. The GRI has pioneered the development of the world’s most widely used sustainability reporting framework and is committed to its continuous improvement and application worldwide. In order to advance this strategy, the GRI certifies organizations as official training partners. CSRCP is a GRI Certified Training Partner in Pakistan.